Art has deep and difficult eyes and for many the gaze is too insistent. Final step: A removable veil to cover the image. The final print, with rubber stamp letters added. The text says "this is not Muhammed." 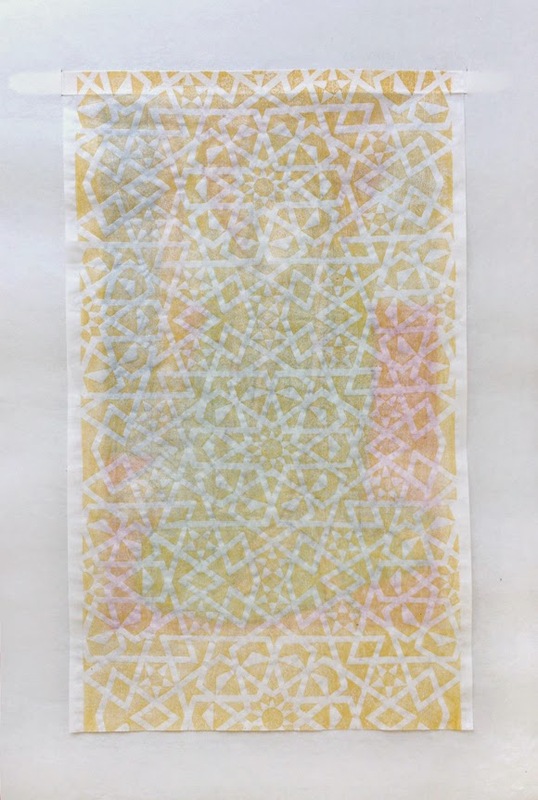 I don't have much to say about the veil, another culturally fraught symbol in conflicts between the so-called west and the so-called Muslim world, but obviously I'm referencing that practice by creating a veil for this print. Also obviously, with my rubber-stamped text I'm referring to Magritte's painting The Treachery of Images, on which he wrote "Ceci n'est pas une pipe" (This is not a pipe), a work that addresses the distinction between the representational and the Real. A Real Fake. Some objects have a certain aura that might be described as magical or somehow otherworldly, and some objects of that nature are art objects. I think some magical art objects, for example The Mona Lisa, acquire their power through accretion and historicity. Some acquire magical qualities through the activites, real or imagined, of the artist – the works of Agnes Martin, say, who lived as a recluse and who is thought of as a kind of mystic. Other art objects, like Warhol works for instance, acquire at least some of their magical properties through their commercial value. And some magical art objects are magical because of the spiritual/religious meanings they carry. 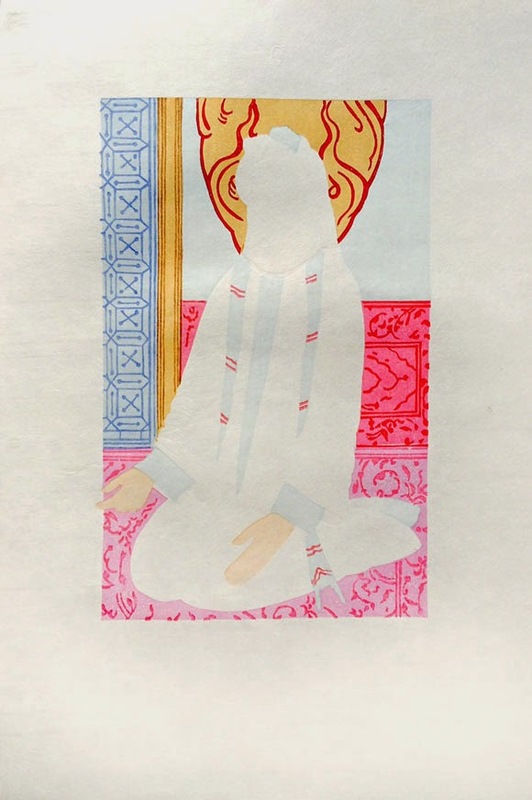 I've been thinking about this a lot as I've worked on my print of the Prophet Muhammad. I've especially been grappling with the question of whether or not the magical properties attributed to the original miniature that I'm copying would or could transfer to my reproduction. I'm deviating from the original miniature quite a bit in this next step in the process as I add gold-colored mica to the flame-halo around the Prophet's head. 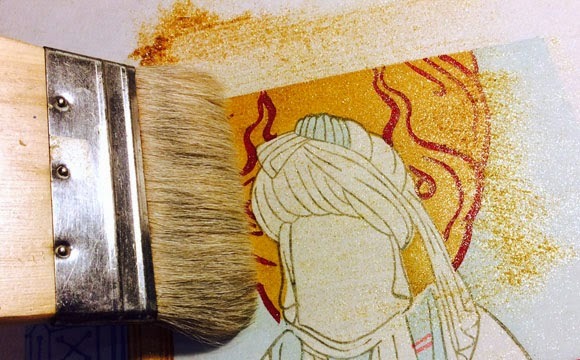 This is a distinctly Japanese technique, where a glue of some kind (I used rice paste) is printed onto the paper and then mica powder is sprinkled on and lightly brushed. Here are photos of my mica application in process. Rice paste is applied to the block with a regular te-bake (hand brush) and the impression is taken with the baren. Immediately after the paper is removed from the block, mica powder is sprinkled on and a soft brush is used to cover the glue with the mica and brush away the excess. Sheen of mica seen in glancing light. If you'd like to see a video of the process, check out a demo by Keiji Shinohara at this web site. (Note: Click Enter Site, then Techniques, then Kira Zuri (Mica Technique)). My studio is full of magical objects; magical because of what they mean to me and remind me of. Here are a few of them. 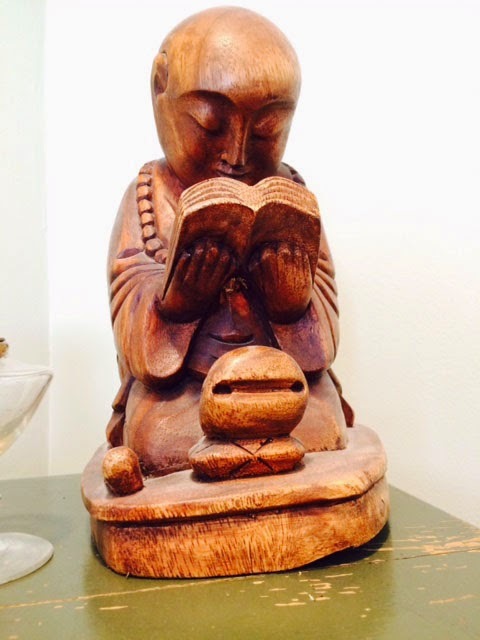 I do so much research in my work, I was drawn to this little scholarly Buddha. 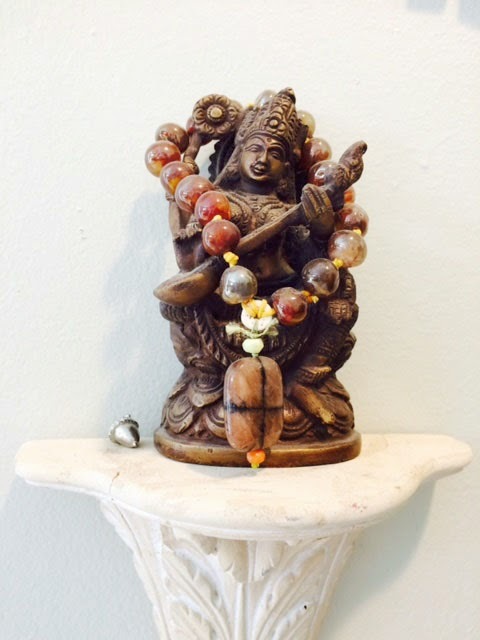 Sarasvati, Hindu goddess of knowledge, music and the arts, wearing a rosary I made. 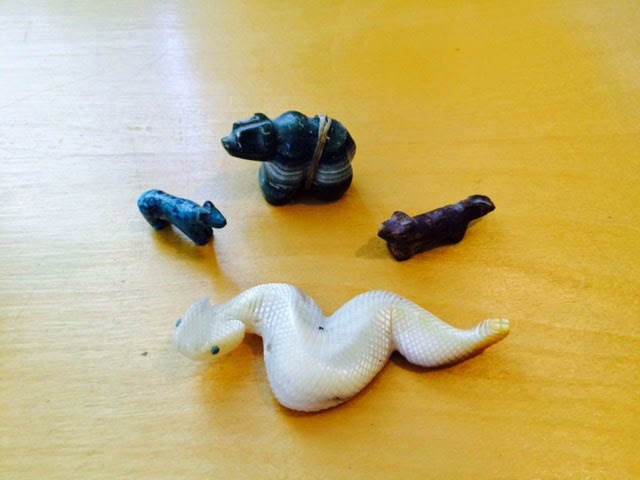 Zuni fetishes I collected while I lived in New Mexico: horse, bear, fox and snake. 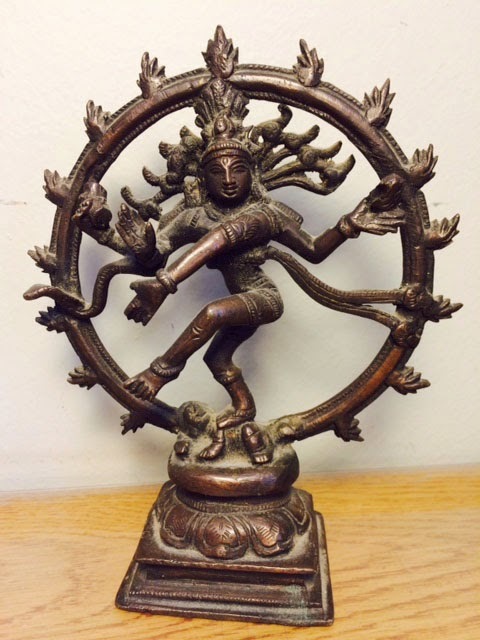 Nataraj (Dancing Shiva), the primal energy of God, whose dance is both creative and destructive. 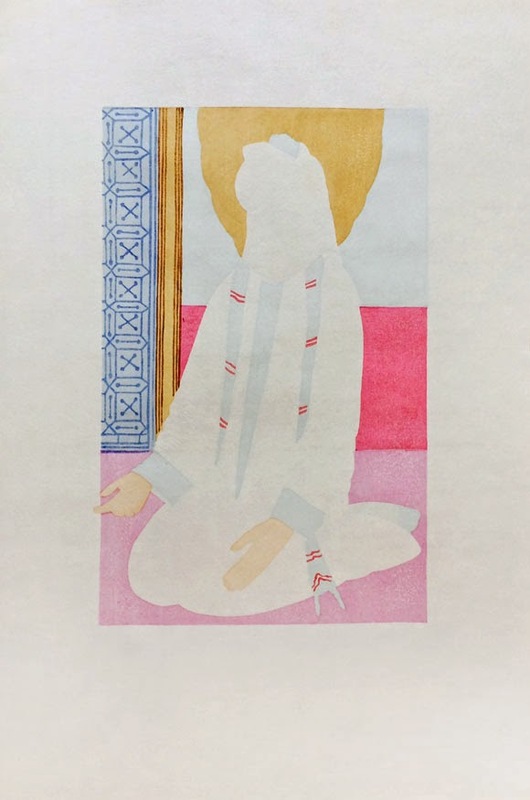 After a fair amount of research about the color of Muhammad's robe, I've concluded that Muhammad is most often, but not always, depicted wearing a green robe. 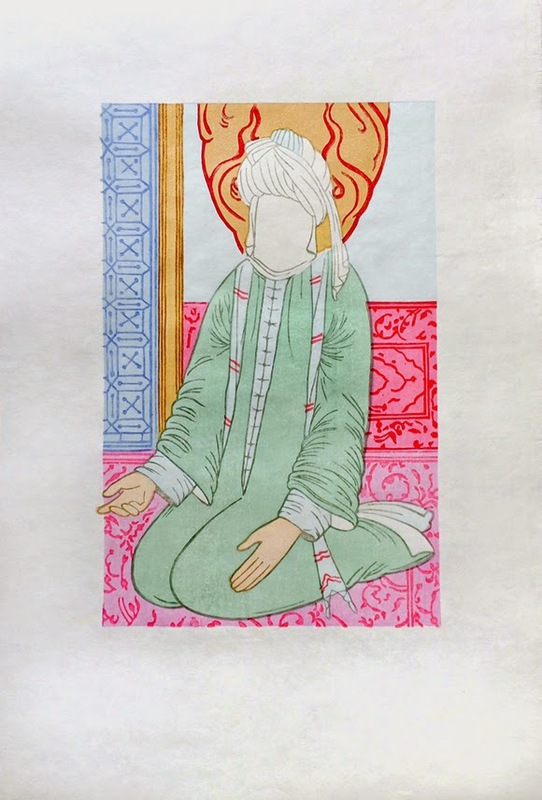 In his book Islam and the Heroic Image, scholar John Renard states, "that robe is one of relatively few specific items in the heroic religious iconography of Islamicate painting," so I'm going with green. Thirteenth color pass: green robe. Yesterday a friend wondered how many blocks were carved for this print and how I broke down the colors, so I thought I'd show you the 6 blocks that I used. A couple of notes. First is that the halo I carved on the upper right block is for applying glue for gold mica (next step). Second note is that in order to economize on wood, I used a single block for the two different magenta colors on the rug and back wall. I carved a thin line between the two areas so I would know exactly where to ink. The white line isn't visible in the final after everything gets printed over it. The third thing you might notice is that sometimes if I've ganged up a lot of colors on one plate I carve away portions of what I've already printed so that the inking is easier for the next color. On the keyblock for example (lower right), you can see that I carved away some of the line work that had printed blue so that I could more easily ink the gray lines around the figure. Of course, this means that I can't ever re-print this set of blocks. The line work in the original miniature on which my reproduction is based has the look of graphite. It's kind of gray, or blue-gray, rather than black, so I decided to print my keyblock in gray to match. 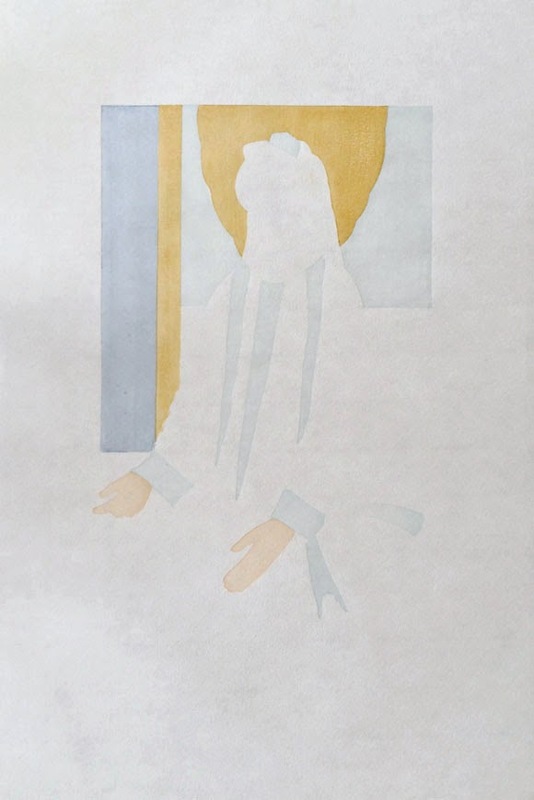 I'm still not sure whether to deviate from the original and keep the robe white, or to make it green so the reproduction is more exact. I'm leaning toward going with the green, since I'm a little nervous that there could be meanings attached to the various colors that I'm not aware of. Twelfth color pass: gray line work. If there's a God I can't imagine why God gave us, wholly imperfect human beings as we are, the ability to imagine purity. When we're faced with contradiction and failure, notions of purity and perfection are like a built-in torture mechanism with which we can oppress both ourselves and others: I'm not good enough, this thing I made isn't good enough, you didn't measure up, you've let us down, you're a loser. Conversely, when we think we ourselves are pure, we become self righteous and arrogant: I'm on the right side of this thing, my country is exceptional, my logic is irrefutable, I know what God wants, you're a sinner, you're a moron, you're unclean, you deserve to die. Fundamentalism, whether religious or secular, is a quest for purity. Fundamentalists regard the world as impure and corrupt, and according to author Richard Antoun (Understanding Fundamentalism), there are three basic strategies that Fundamentalists employ in order to deal with this perceived corruption in the world: migration (eg. the Pilgrims coming to America), separation (Christian colleges such as Bob Jones University), or militant struggle (Al-Qaida). Large organizations like ISIS as well as small groups of terrorists like the Charlie Hebdo shooters have chosen the third option. Tenth color pass: linework on back half-wall. Meanwhile, I'm dealing with purity issues of my own regarding this print. If you think about it, I'm trying to make a 'pure' image of Mohammed. But now part of me doesn't want to make the robe green as it appears in the original. 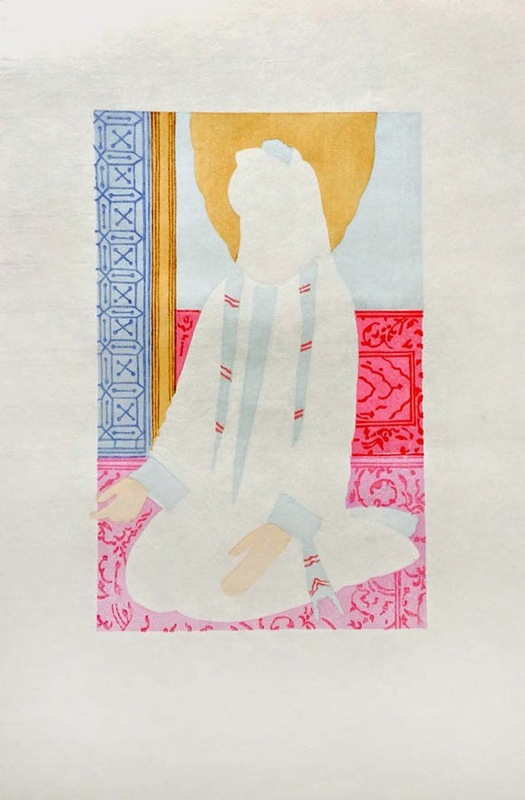 I like it white, but the rules I set up at the beginning of this project include making a close reproduction of a 16th century Persian miniature, and I don't think I can wiggle out of that without messing up the purity of my premise. 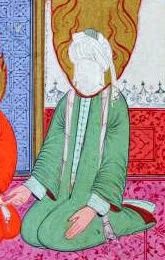 Muhammed is wearing a green robe in the miniature painting I reference, and he is shown wearing a green robe in most historic depictions. The green color is said to be associated with Islam, for which I found a myriad explanations. If you're truly interested, here's an article I referenced about color in Islam. According to this article, it would not be out of place for me to use white for Muhammed's robe, as white signifies purity and harmony. There's that purity thing again. Eleventh pass: red lines in flaming halo. Since I can't decide what color to make the robe, I think I'll print the keyblock next and see how I like it. Seventh pass: blue linework on the left. Religion is a problem. And I say this as someone who actually loves religion. I've been interested in religion since childhood. I have a proclivity toward spiritual or mystical experiences which I can't seem to help, even as I find lacking the intellectual underpinnings of most philosophies/religions that provide language for such experiences. I'm no anti-theist; not an atheist either. Maybe an agnostic, with a dash of humanist optimism and a lot of interest in the ancient spiritual technologies that the world's religious systems hold. In spite of my interest, though, the rules and regulations and lists and arcane details embodied in Christianity, Islam, Judaism, and even Buddhism are overwhelming and boring and frankly make my eyes glaze over. Eighth pass: brown vertical lines along the gold trim. One key point seems to be that there were, or are, different rules in different regions, with stronger prohibitions in the Arab states and fewer in non-Arab places like Turkey and India. Ninth pass: Linework on rug. Nothing could be clearer. It's not just pictures of Muhammed, but all pictures that should not be made. And it's not just infidels who make pictures that are condemned, but anyone who makes pictures. Artists, all artists, condemned to torment in hell by Islam. So here I am, embarked on another quixotic adventure. 1. A two-dimensional non-realistic or semi-realistic drawing or painting intended for satire, caricature, or humor. 2. The artistic style of such works. 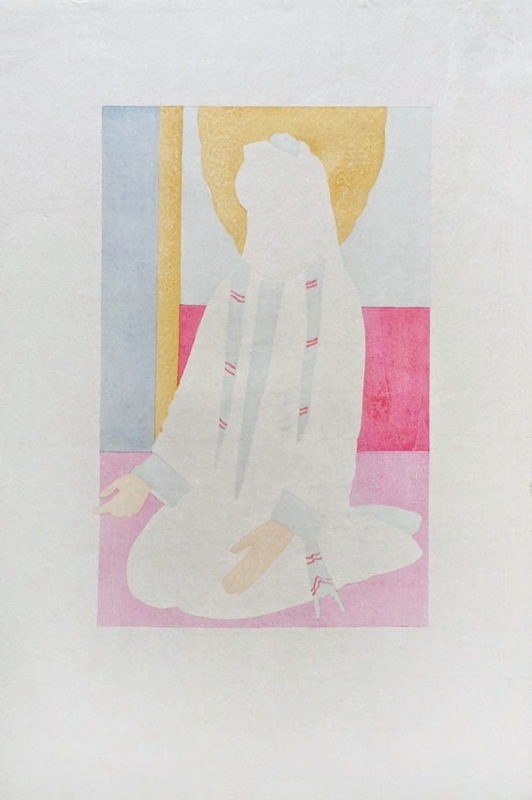 As I mentioned in an earlier post, this "real fake" will be fake because it's a Japanese style woodblock reproduction of a work I found online that was originally a painting. It is not a cartoon. Cartoon images of Muhammed have caused much uproar in recent years among Muslims, but this is not a cartoon. Or is it? I plan to give this image the full ukiyo-e treatment: the figure will be defined by thin lines with areas of color underneath and shiny gold mica powder in his halo. Interestingly, ukiyo-e prints are historically connected to cartoons, called manga, in Japan. Sixth pass: Darker magenta on back wall and stripes on scarf. 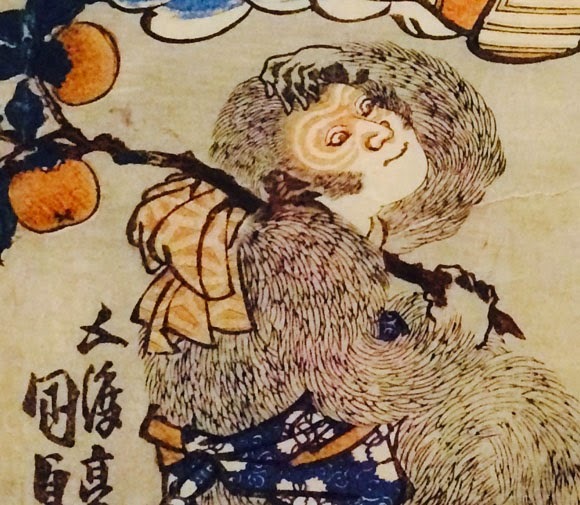 So am I inadvertently making this 16th century painted image into a cartoon by using ukiyo-e techniques to render it? Even if it ends up looking just like the painting? This project raises more questions than it answers. On another note, I'm at a point in the printing process where I really like the image just as it is and I'm tempted to just stop here. This often happens. I think that the project needs me to keep going, though. 1. great disrespect shown to God or to something holy. 2. irreverence toward God, religion, a religious icon, or something else which is considered sacred. Most religions have some definition of blasphemy and some history of punishing people for it. Blasphemy in Christianity is viewed as a mostly medieval preoccupation, but there have been blasphemy laws on the books in various U.S. states since colonial times, some of which were not repealed until quite recently. In Judaism blasphemy is punishable by death in the Torah, but there are few instances of those laws being applied since Biblical times. Even in Buddhism, there are places in modern day southeast Asia where blasphemy charges have been leveled for misusing images of Buddha. But it seems to be Islam among all the religions that right now in the 21st century is most fixated on blasphemy. From Ayatollah Khomeini’s fatwa against the writer Salman Rushdie in 1989 to the protests and murders in Europe against newspaper cartoons lampooning the Prophet Muhammed, mockery of Islam, actual or perceived, has been countered with violence by Muslims all over the world. 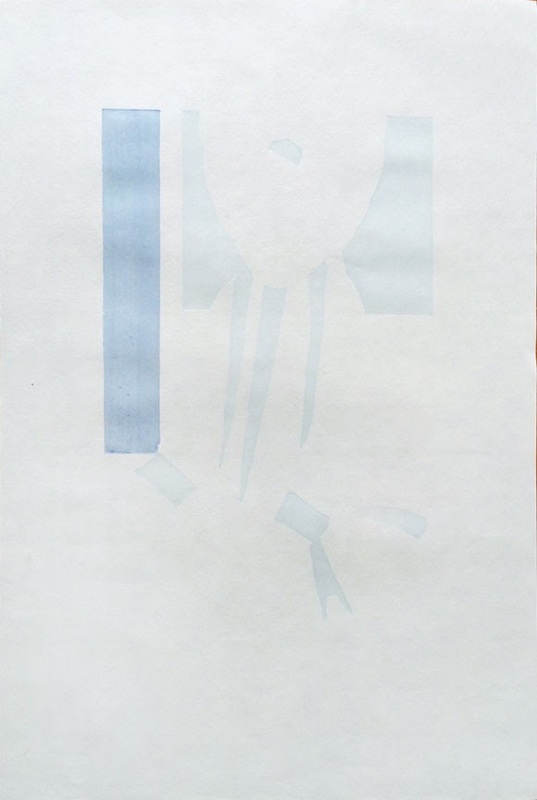 Second pass: a darker blue is printed in one area of the same block. According to Wikipedia, Islamic writings define many types of blasphemy. Some examples include "insulting or cursing Allah, or Muhammad; mockery or disagreeable behavior towards beliefs and customs common in Islam; criticism of Islam's holy personages. Apostasy (abandoning Islam) or finding faults or expressing doubts about Allah (ta'til) and Qur'an, rejection of Muhammed or any of his teachings, or leaving the Muslim community to become an atheist is a form of blasphemy. Questioning religious opinions (fatwa) and normative Islamic views can also be construed as blasphemous. Improper dress, drawing offensive cartoons, tearing or burning holy literature of Islam, creating or using music or painting or video or novels to mock or criticize Muhammad are some examples of blasphemous acts. In the context of those who are non-Muslims, the concept of blasphemy includes all aspects of infidelity (kufr)." There's a verse in the Quran that speaks of "those who annoy Allah and His Messenger" and there seem to be very many ways available to annoy them. 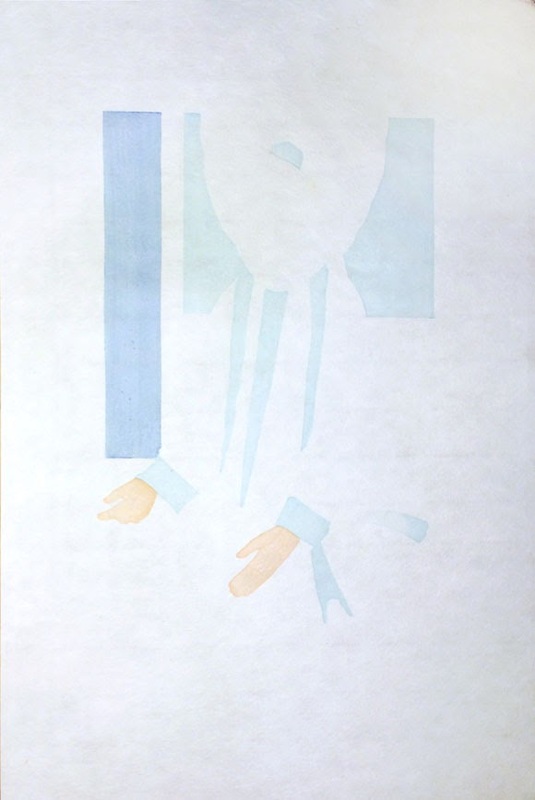 Third pass: a fleshy color is added to the hands using a second block. 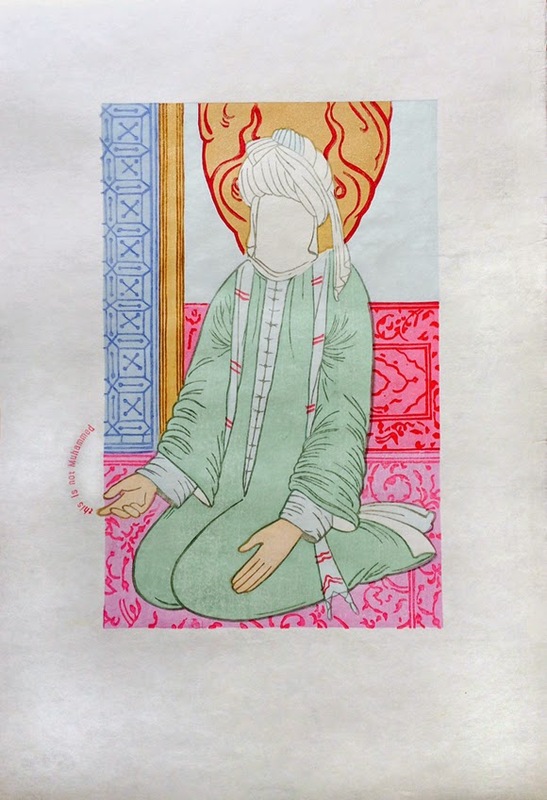 In some historical images of Muhammed, the hands are shrouded along with the face being veiled. 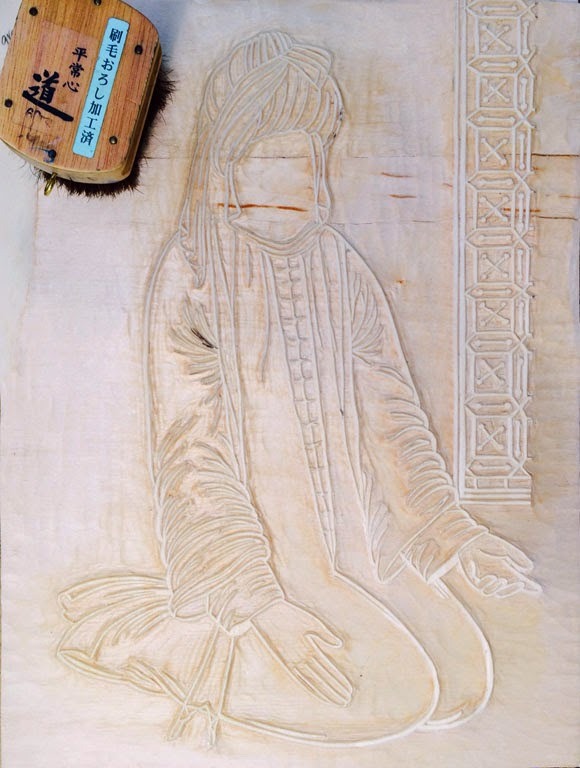 So what about my woodblock print of Muhammed? Is it blasphemous? From the list above, I would guess that my biggest problem in the eyes of Islam would be that I am non-Muslim and thus an infidel, probably making me unauthorized to depict the Prophet. Since I'm making a close copy of a historic Islamic painting, I can't be accused of creating a cartoon. The only other gray area might be in the realm of artistic intention. Do I intend to honor Muhammed and Islam or to find fault and question them? This is a thorny question, because if I don't answer it then how can you know? Not by looking at the image: I intend for the image to be a neutral reproduction. If I say that I intend to criticize Islam with my image, then it isn't the image that indicts me but my words about the image. Conversely, I can say that I intend to honor Islam with my image, but how do you know that this is true? How do you know, for example, that I didn't spit in the pigments I'm using? There's another turnaround I've been contemplating as I've worked. This image may be blasphemous in a whole other way inside my own society and culture. The United States is "at war" with "terror," which most Americans interpret to mean at war with radical Islamists, and which some interpret as being at war with Islam itself. I know a number of people who might be quite offended by this image. They would likely not call my offense "blasphemy," but I think there's a kind of nationalism that would find my examination of an image of Muhammed to be unpatriotic or even some kind of treason, and isn't that just blasphemy in secular terms? There are also those who would take even more offense if they knew that I was making an image of Muhammed while listening to a chant praising Allah. I have the song below set to repeat in my iTunes and have now played it more than 60 times while I work. I like it a lot. It's sung here by a nine-member male vocal a cappella ensemble called Cantus. Click the play button to take a listen to this piece, called Zikr. I'm writing this post as a bit of an apology for my last post, in which I bragged about how fine a line I can cut on shina plywood. It's true that I can get a pretty thin line on shina plywood. 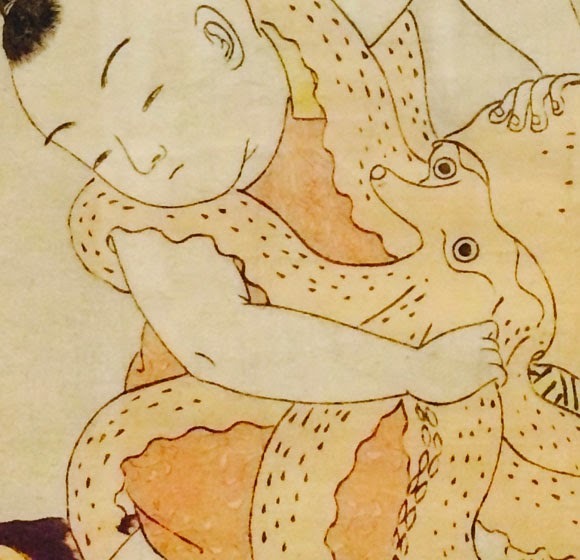 But today I went to the Mead Art Museum at Amherst College and I saw some Japanese woodblock prints at an exhibit called "Nature, Pleasure, Myth: Animals in the art of Japan" and I was severely chastened. The lines I saw on those prints were thinner than thin; so thin that they were almost invisible when printed. I could never ever ever do what I saw today on shina plywood. It put me in my place for sure. Let me show you. 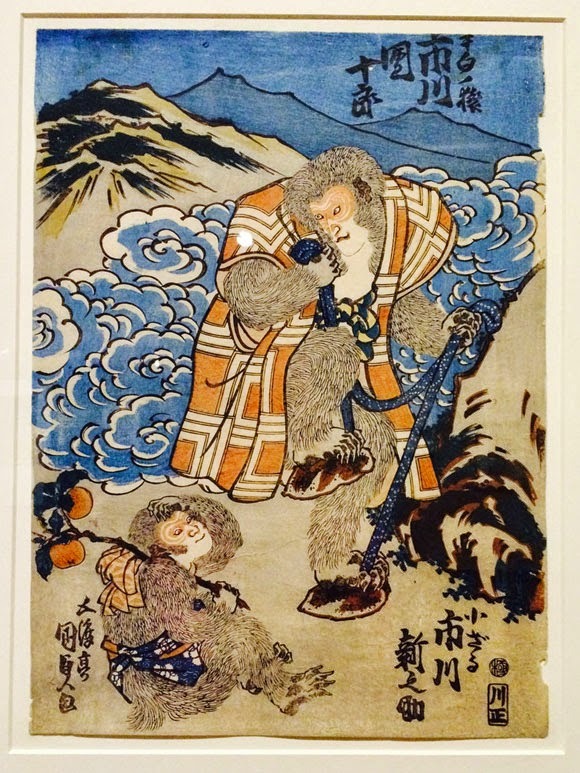 This is a woodblock print by Utagawa Kunisada depicting a couple of people as monkeys. Just look at that fur! 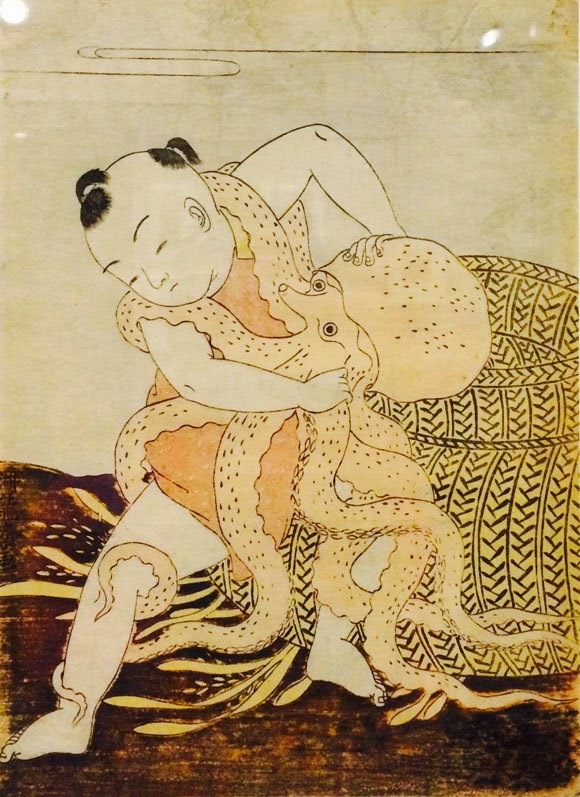 And here's a print from 1772, "Child Wrestling with an Octopus," by someone named Isoda Koryusai. Such beautiful delicate lines. Not shina plywood. I recommend this exhibit if you find yourself in Amherst, Massachusetts, between now and the end of June. And if you want to learn how to carve really fine lines like these, I don't recommend shina plywood! 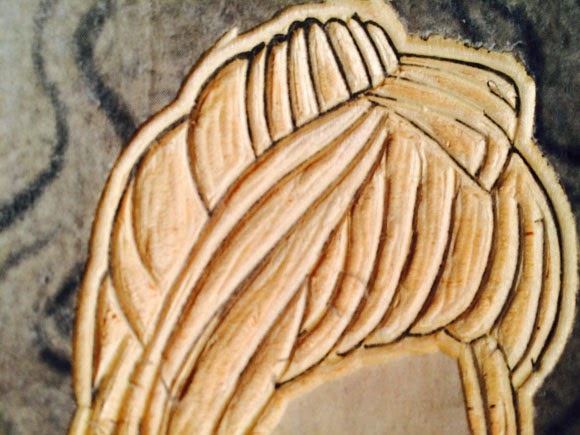 NOTE, ADDED 2/13/15: See next post for more discussion of carving thin lines. There was a discussion a week or two ago on the Facebook page of the Baren Forum (a group dedicated to watercolor woodblock printing) about carving fine lines on shina plywood, so I wanted to address this post to that topic. Many woodblock artists insist that a fine keyblock can't be cut on shina (a Japanese wood related to bass wood or linden) and must be cut on a harder wood like maple or cherry. 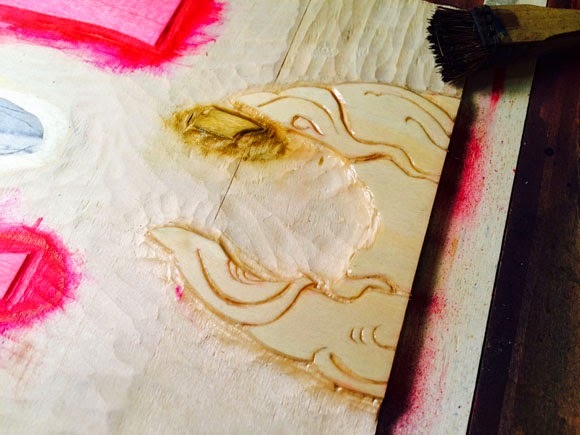 The Japanese ukiyo-e masters used cherry. However, I've found that for my purposes shina is OK for fine lines. I use a Japanese knife tool called a hangi-to, which resembles an X-Acto blade, to cut on either side of the line work. Then I clear around the knife lines with gouges. 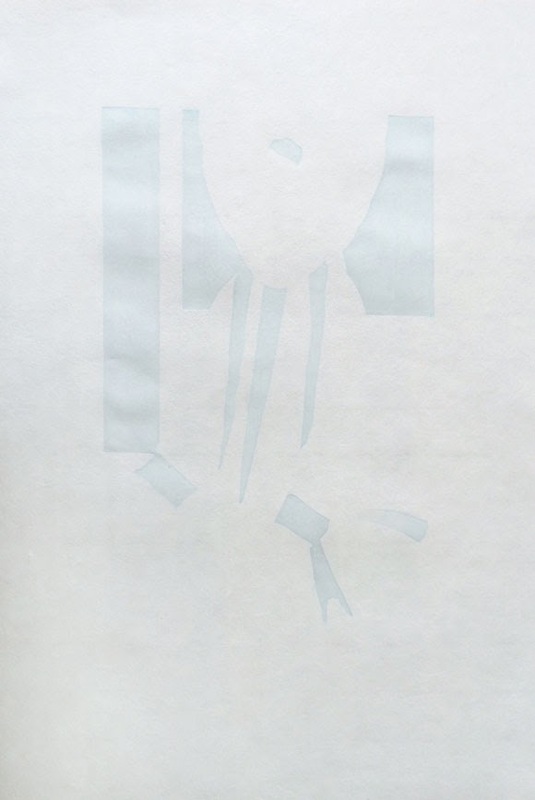 Below is the key block for my "A Real Fake" print with the paper hanshita (sketch) removed. Now I'll go back in with my knife and touch up the lines to make some of them thinner still. For more info on cutting lines, see this blog post. 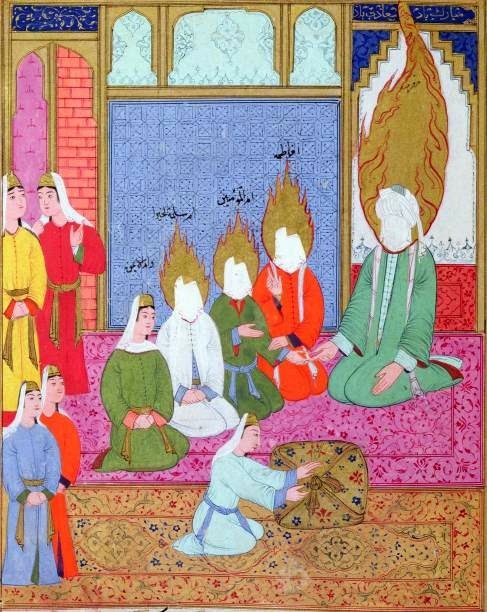 This image is probably from a Turkish epic/biography called the Siyer-i Nebi. Something I find interesting about this work is that it is itself a reproduction. It's a 16th century reproduction of a 14th century painting. So I will be doing a Japanese-method woodblock reproduction of an online reproduction of a 16th century painted reproduction of a 14th century Islamic painting. As I mentioned in the previous post, I don't want to invent my own image of Muhammed. 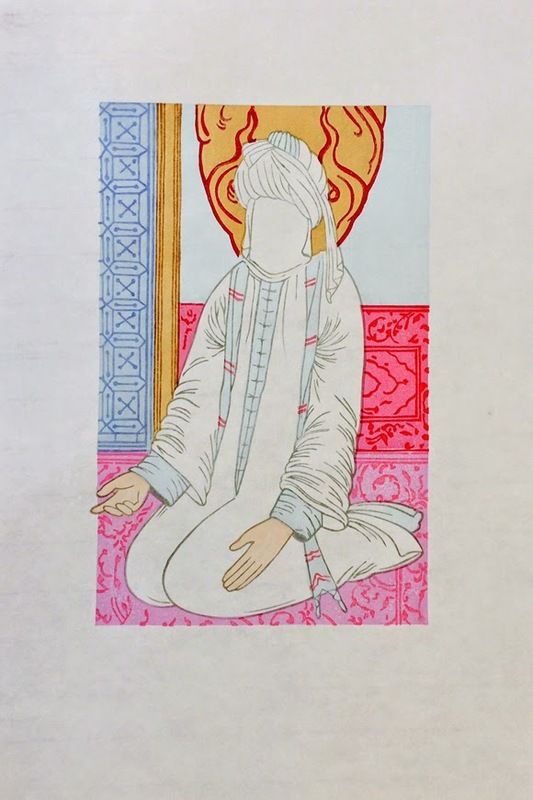 I want to work from an Islamic historical image so that any objection to my portrait can't hinge on an argument that picturing Muhammed is prohibited by Islam. It is obviously not prohibited by Islam, since this image exists, was created in an Islamic culture, and has existed for 700 years. Because of the touchiness of this project, I find myself more acutely aware than usual of both my motives and my decisions. Every decision I make feels like it has large consequences. 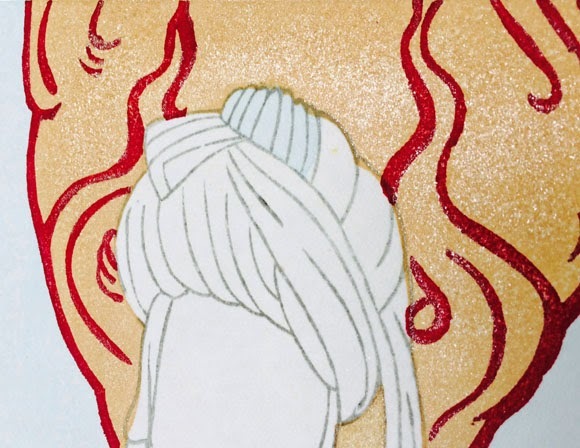 My first decision is to crop in tightly on the figure of Muhammed, basically taking him out of context and out of the story of Fatima and her Jewish wedding party. 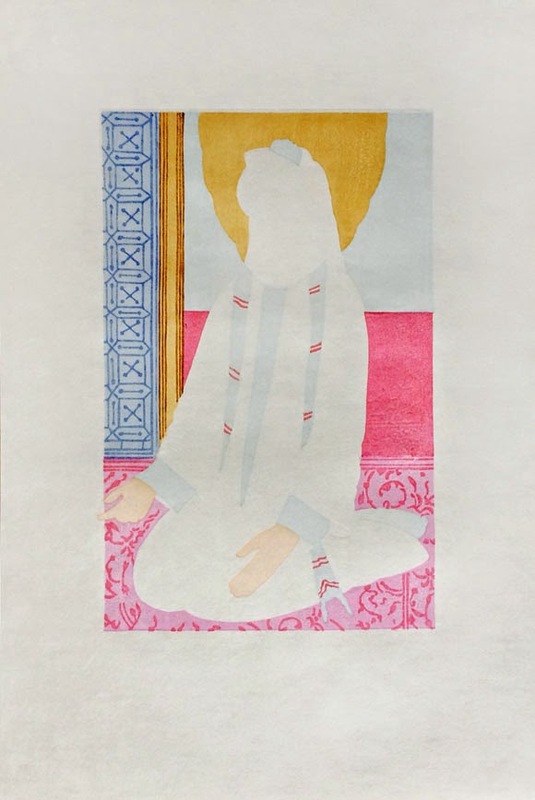 For this print, I'm not interested in anything about Muhammed except his form, his image. Beyond the obvious distinction between racist provocations on one hand and pious homage on the other… one towering fact emerges: The life of the Prophet of Islam has now entered a global scene far beyond anyone's claim or control. 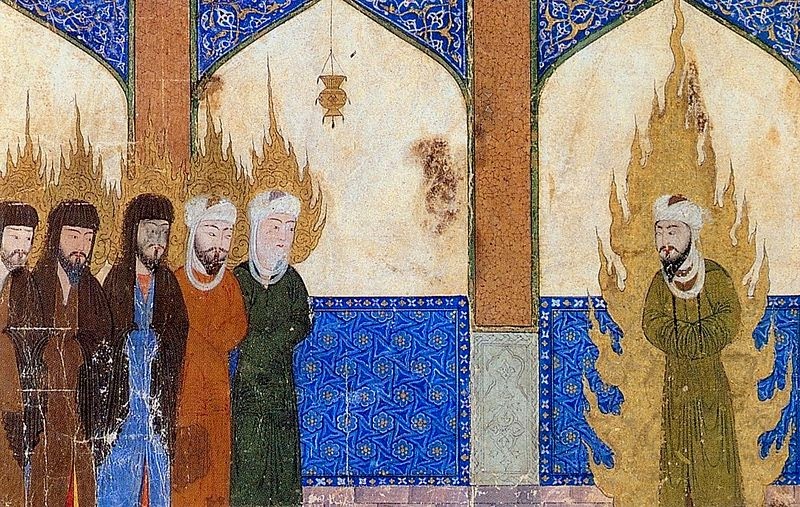 The Charlie Hebdo attack was not the first time that depictions of Muhammed by westerners have caused fury in the Muslim world, and will likely not be the last. The belief that Islam prohibits depicting the prophet is cited often, but it seems to be not true. 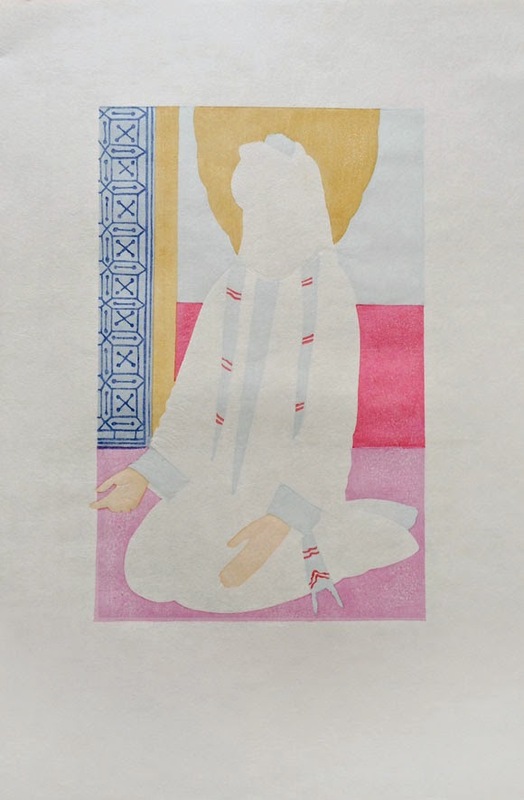 The practice is not banned anywhere in the Qur'an, and there are in fact many historical instances where the prophet has been depicted within devotional Islamic art. Many of these gorgeous paintings, called "miniatures," are housed in major museums and libraries although, unfortunately, many have been removed from public display because of the recent controversies. Nevertheless, a simple Google Image search reveals many examples of images of Muhammed, although many show his face covered with a veil. • Who gets to claim or control an image? • Are there images an artist has no right to make? • Why do some images have so much charge? • Can a westerner create a respectful depiction of Muhammed, or am I forbidden simply because I am not Muslim? • If I do a reproduction of a historical image, am I the author of that image? Can I be held responsible for it? • Does my attitude while creating the image matter or is it just about the final image? 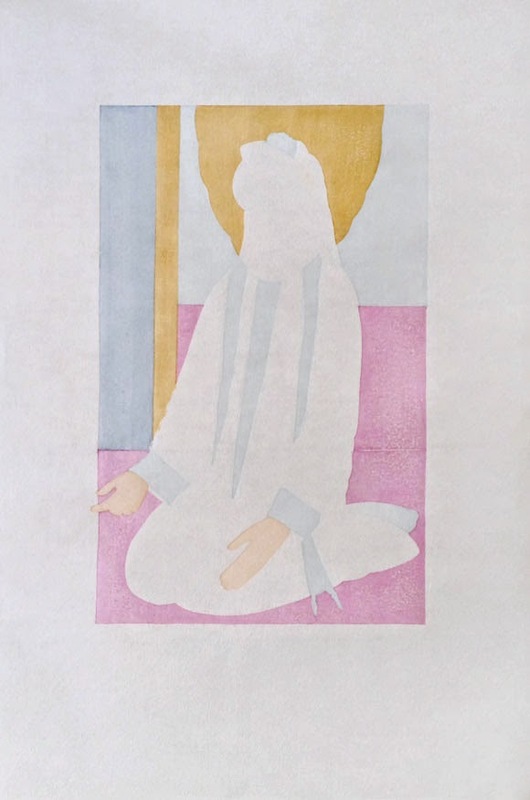 • If I make a woodblock reproduction of a painting, is it real or a fake? • What is a cartoon? The title, "A Real Fake," seems perfect for an examination of questions about the power of image, the reality and unreality of two-dimensional art, reproduction, and authorship that come up in this context. As the brief states, "A work of art is never fixed or absolute: it doesn’t exist independently and once released, the work evolves and is often interpreted in different ways by the viewer. The brief also states, "the truest part of the work resides in the original act of creation." I'm not sure if I agree with that or not, but I'll be asking that question as I work. 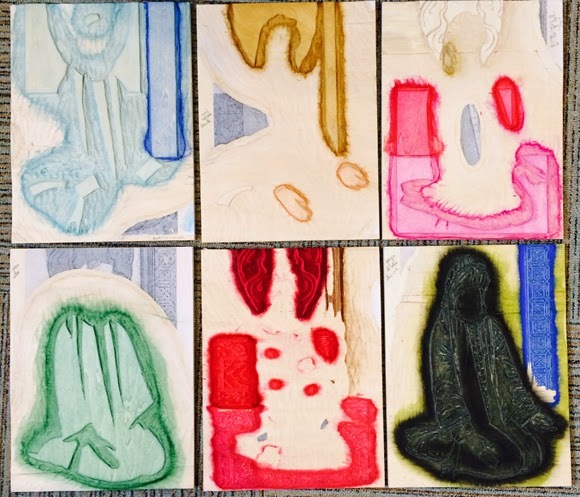 There's a tradition in printmaking that doesn't really exist in other art forms called a print exchange, or portfolio exchange. Print artists are invited to participate and each member who agrees to participate makes an edition large enough to supply one print for each participant plus a couple of extra. Exchange coordinators then usually collate and box the sets and each artist receives a folio. In addition, the extra sets are generally shown in galleries or placed in collections. For various reasons, not the least of which is that I don't enjoy making large editions, I don't participate in exchanges often, but I like to do them occasionally, especially when the exchange is associated with a group of artists I want to support or become better acquainted with. 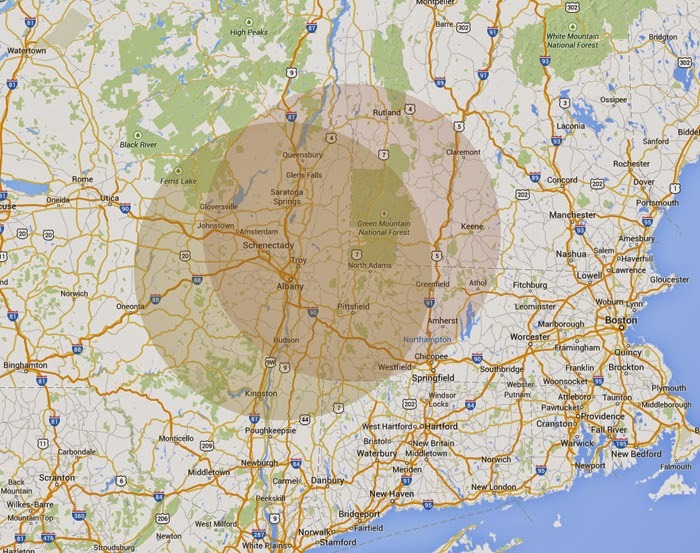 A few years ago I participated in the Zea Mays anniversary portfolio called Ten, and this year I've signed up to make a print for an exchange between artists in the "upper northeast," which is defined as a 60-mile radius from Troy, New York, and a 60-mile radius from Bennington, Vermont. I'm looking forward to getting to know some new artists in my region. work of art represents the interfusion of our thoughts and decisions, and as such, the end result testifies to the creative moments we experienced during the making of the work. truest part of the work resides in the original act of creation. The part of the brief that struck me and that I plan to work with is the title, "A Real Fake," and the line "A work of art is never fixed or absolute: it doesn't exist independently and once released, the work evolves and is often interpreted in different ways by the viewer."